Now that I've got the monumental responsibility that comes with having a kid of my own, I consider more of my actions than I ever did before. Thinking ahead about parenting decisions instead of employing the old shoot-from-the-hip-method will help us (I hope) make fewer decisions in need of overturning at a future date. Whether or not to celebrate Halloween is one such decision. In my early years, I experienced the joy of dressing up as a princess and other benign characters to survey Grandma and Pop's neighborhood for treats. 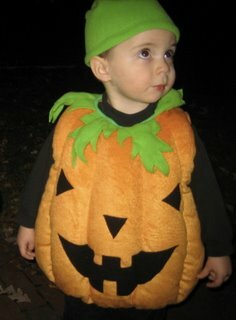 Later in my growing up years, say from the age of 10 on, my parents decided that we'd not celebrate Halloween because it was a pagan holiday with evil roots. Once they learned about the day's origins, my parents took the holiday seriously and thought it best for my sister and I to exclude ourselves from dressing up, parties and trick or treating. For me, it was like the blind person who loses her vision as a child-- I knew what it was like to have the fun of canvassing the neighborhood-- so taking it away was traumatic. To my knowledge, Sarah never got to trick or treat since she was so much younger when my parents had their revelation. That's traumatic too for a young kid-- having to explain why you're the only weirdo in 3rd grade who doesn't have a costume on. I'm not going to be overly dramatic and say all those missed Halloweens ruined my childhood (I can only speak for myself) but the whole thing would have made a lot more sense to me if I'd never been allowed to dress up and it was family policy from the beginning. So these days, I know my parents' reasons and I agree with some of them. But I think just because you let your kids put on a costume doesn't mean next year they'll lead a seance. In my opinion, just as you can make Christmas all about Santa Claus if you so choose, you can also make Halloween just about the wholesome fun that comes with it. That's not to say we do the former, it's just an example of how the true purpose of a holiday can easily be separated from how one chooses to celebrate it. That said, Sam and his future siblings will get to celebrate Halloween within range of our watchful eyes, choosing costumes that are friendly, funny and cute. On a somewhat related note, I noticed a slew of horror movies on tv this week. For me, it's like a sadistic curiosity. When I was ever drawn to one in the past, I inevitably ended up with nightmares and a feeling of dread in my stomach. This year I passed on the horror because I decided there's nothing good about putting such dark visuals into my head. And the same goes for Sam; as he grows up I want him to input good stuff like puppy dogs and canoe races. I realize there'll be plenty of negativity going in that's out of my control. Bob disagrees though. One of his favorite movies is Hannibal which, when I think about it, scares me a bit. He swears it's for the scenes of Italy. What's your take on the horror genre?